Canada’s Top Small and Medium Employers 2018 think big when it comes to creating jobs. Many of the winning SMEs grew significantly over the past year, reporting increases of up to 50 per cent or more in new full-time positions. Examples include Wave, a Toronto financial services software company, with a year-over-year work-force increase of 58 per cent, and Solink Corp., a video surveillance software developer in Kanata, Ont., that expanded its work force by approximately 50 per cent. That kind of rapid growth is good news for the Canadian economy and for job-seekers since SMEs employ more than 90 per cent of the private-sector labour force. In their drive to acquire top talent, these top SMEs typically encourage staff to become recruiters for the company, offering generous referral bonuses – of up to $5,000 in some companies – for each successful hire from an employee’s network. Other financial perks typically offered include profit sharing, year-end bonuses for all employees and opportunities to become owners through share-purchase plans. Feeling you have skin in the game creates an ownership culture where people feel inspired to make their workplace the best it can be. Every one of Canada’s Small and Medium Employers 2018 offer competitive benefits rivalling those traditionally associated with much larger companies. Best practices include continuing support for career development, such as tuition subsidies for courses both related and unrelated to the employee’s current position, as well as for professional accreditation, plus a wide range of in-house training and mentorship programs. The softer side of these companies shows consideration for employees’ health and comfort with progressive initiatives, such as onsite fitness facilities with instructor-led classes, flexible benefits with wellness spending accounts, fresh fruit deliveries for free healthy snacks and well-equipped lounges where staff can unwind. While foosball and video games are standard, some go well beyond the expected by providing an ice rink and beach volleyball court – hello, Waterloo-based software firm TextNow. It’s no wonder these over-achieving SMEs are thriving. It’s worth taking a look to see what they’re doing. Canada’s Top Small and Medium Employers is an editorial competition that recognizes exceptional small and medium enterprises (SMEs) across Canada. The competition is limited to private-sector commercial organizations with fewer than 500 employees worldwide. Non-profit organizations are not eligible. The Top 100 editors at Toronto-based Mediacorp Canada Inc. evaluate employers according to the same eight key areas used for judging in the national competition of Canada’s Top 100 Employers: physical workplace; work and social atmosphere; health, financial and family benefits; vacation and time off; employee communications; performance management; training and skills development; community involvement. Employers are compared with other organizations in their field to determine which ones offer the best workplaces and forward-thinking human resource policies. Whether an employer has positive employment growth is also a factor in determining the winners. As well, the unique initiatives of each employer are taken into account. Staff at Uken Studios Inc. in Toronto work on the next blockbuster video game. /N SPRO Inc., Montreal. Computer consulting; 70 employees. Holds an annual corporate retreat for employees in a sunny destination. A Thinking Ape Entertainment Ltd., Vancouver. Game developer; 70 employees. Provides weekly onsite yoga classes led by a certified instructor. Abilis Solutions, Montreal. Computer software; 143 employees. Helps employees save for the longer term with matching RRSP contributions. Absorb Software Inc., Calgary. Learning management systems; 102 employees. Provides unlimited tuition subsidies to employees for courses related to their current position. Accompass, Toronto. Financial and benefits consulting; 36 employees. Starts new employees with three weeks of paid vacation with additional time off during the winter holiday season and up to five personal days. ACL Services Ltd., Vancouver. Custom computer programming; 238 employees. Recognizes exceptional performance through numerous rewards, including stock options, a $5,000 education bursary and one-on-one mentoring with the CEO. AGNORA Inc., Collingwood, Ont. Glass and glazing contractors; 72 employees. Offers employees a $500 health spending account that can be used to cover additional health-related expenses. Archon Systems Inc., Toronto. Software development; 15 employees. Encourages employees to become owners through a share purchase plan, available to all employees. BBG Management Corp., Ottawa. Technology consulting and business services; 50 employees. Supports employees who are new mothers with maternity leave top-up payments. Beedie Development Group, Burnaby, B.C. Real estate development; 230 employees. Provides tuition subsidies for courses directly and indirectly related to an employee’s current position. Benevity, Inc., Calgary. Software developer; 324 employees. Added more than 100 new full-time positions to its work force in the past year, a year-over-year work-force change of nearly 50 per cent. Big Viking Games, London, Ont. Game developer; 105 employees. Provides an employee lounge, complete with foosball, television, board games, hammock and a custom-made tiki bar. BIMM Management Inc., Toronto. Digital marketing; 61 employees. Encourages employees to become recruiters with generous new employee referral bonuses when they successfully recruit a friend. CBCL Ltd., Halifax. Engineering; 261 employees. Lets everyone share in the company’s success with profit sharing. Chandos Construction Ltd., Edmonton. Construction and project management contractors; 389 employees. Offers in-house and online training options as well as tuition subsidies for courses taken externally. Clio, Burnaby, B.C. Computer software; 194 employees. Provides a casual work environment with monthly mixers and poker nights, employee sports teams and a pet-friendly policy that lets employees bring their pets to work when needed. Cole Engineering Group Ltd., Markham, Ont. Engineering; 266 employees. Encourages employees to adopt healthy habits with free access to an onsite fitness facility and a dedicated wellness room. Community Trust Co., Mississauga, Ont. Financial products and services; 94 employees. Offers employees a variety of alternative work options to help them balance their work and personal lives. Connected Lab Inc., Toronto. Software developer; 83 employees. Provides an office lounge featuring healthy snacks, hammocks, hula hoops, virtual reality headsets, chess, Lego, Netflix and a beer fridge. Cority Software Inc., Toronto. Software developer; 143 employees. Supports a number of local, national and international charitable initiatives each year. Cowell Motors Ltd., Richmond, B.C. New car dealerships; 220 employees. Offers numerous financial benefits, including signing bonuses for some employees, year-end bonuses for all and referral bonuses. CREIT Management LP, Toronto. Real estate investment trust; 156 employees. Provides retirement planning assistance and phased-in work options for those nearing retirement. Croesus Finansoft Inc., Laval, Que. Financial management software and services; 168 employees. Encourages employees to adopt healthy habits with weekly deliveries of fresh fruit and free access to an onsite fitness facility. Crombie REIT, New Glasgow, N.S. Property management and development; 271 employees. Offers employees a variety of in-house and online training programs as well as tuition subsidies for courses related and not directly related to their current position. Deep Foundations Contractors Inc., Stouffville, Ont. Construction; 275 employees. Lets everyone share in the fruits of their labour through profit sharing. Diabsolut Inc., Pointe-Claire, Que. Computer software; 85 employees. Encourages employees to keep their skills up-to-date through generous tuition subsidies with no annual maximum. Diamond Schmitt Architects Inc., Toronto. Architecture firm; 199 employees. Reaches out to the next generation through apprenticeship programs, co-op opportunities and paid internships. District M Inc., Toronto. Software developer; Montreal, 39 employees. Provides a casual work environment where pets are welcome, along with a fun and busy social calendar. Drake Hotel Properties, Toronto. Hotels and restaurants; 115 employees. Offers a unique workplace culture and atmosphere with employee events and celebrations throughout the year. eSentire Inc., Cambridge, Ont. Cyber security; 245 employees. Supports employee efforts to adopt healthy habits with a wellness spending account. EventMobi, Toronto. Software developer; 74 employees. Supports parents-to-be with maternity and parental leave top-up payments with the option to extend their leave into an unpaid leave of absence. Flaman Sales Ltd., Saskatoon. Retail, farm machinery and equipment and home fitness; 291 employees. Provides head office employees with free access to an onsite fitness facility as well as an outdoor pond skating rink in winter. Fleet Complete, Toronto. Fleet and mobile resource tracking; 190 employees. Offers matching RRSP contributions and year-end bonuses available to all employees. Fresche Solutions Inc., Montreal. Computer systems design; 128 employees. Recognizes exceptional performance through a number of initiatives, including on-the-spot awards and peer-to-peer recognition. FreshBooks, Toronto. Software publishers; 248 employees. Provides an employee lounge with video games, foosball, a pool table, massage chairs and remote-controlled race cars. Frozen Mountain Software Ltd., Surrey, B.C. Computer software; 29 employees. Provides a nap room for those who need a break during a busy day. Fuller Landau LLP, Toronto. Accounting; 110 employees. Encourages employees to reach out to their community with up to two paid volunteer days and in-kind donations for volunteerism. Fusion Project Management Ltd., Vancouver. Interior design; 42 employees. Provides a modern downtown office, complete with ball chairs for alternative seating options. Great Little Box Company Ltd., The, Richmond, B.C. Box manufacturing; 257 employees. Offers reserved parking for 20- and 30-year employees, carpoolers and hybrid auto drivers. GroupHEALTH Global Benefit Solutions Inc., Surrey, B.C. Health benefits plans; 144 employees. Provides regular deliveries of fresh fruit and vegetables plus occasional treats such as ice cream, popcorn, popsicles and cake. GSOFT, Montreal. Computer software; 205 employees. Added more than 60 new full-time positions in the past year, a work-force growth of 44 per cent. Harbour Air Group, Richmond, B.C. Airline; 286 employees. Offers a busy social calendar celebrating birthdays, anniversaries, baby showers and retirements throughout the year. Harvard Developments Inc., Regina. Commercial real estate management and development; 159 employees. Offers academic scholarships for employees’ children. Hyperwallet Systems Inc., Vancouver. Financial transaction processing service; 239 employees. Created more than 50 new full-time jobs, a year-over-year work-force change of 30 per cent. Integrated Sustainability Consultants Ltd., Calgary. Environmental consulting; 61 employees. Offers tuition subsidies to employees for courses related and not directly related to their current position, with no annual maximum. Intelligent Mechatronic Systems Inc. / IMS, Waterloo, Ont. Automotive telematics technology; 118 employees. Considers previous work experience when setting individual vacation entitlement for new hires. InvestorCOM Inc., Brantford, Ont. Computer software; 89 employees. Encourages employees to become recruiters with generous new employee referral bonuses. iQmetrix, Vancouver. Computer software; 380 employees. Provides an employee lounge area complete with a wine fridge and two taps of craft beer. Jacob Bros Construction Inc., Surrey, B.C. Construction; 197 employees. Added almost 40 new positions in the past year, an increase of just under 25 per cent year-over-year. Kanetix Ltd., Toronto. Digital customer acquisition software; 117 employees. Allows all employees to receive their birthday off every year. Keystone Environmental Ltd., Burnaby, B.C. Environmental consulting; 79 employees. Manages a generous year-end bonus program available to all employees. Kinaxis Inc., Ottawa. Software developer; 307 employees. Provides numerous onsite amenities, including a quiet room for meditation and religious observance. Lawton Partners Financial Planning Services Ltd., Winnipeg. Financial planning; 60 employees. Offers phased-in work options to help those nearing retirement make the transition. Left Coast Naturals, Burnaby, B.C. Organic food manufacturing; 55 employees. Offers environmental bonuses to encourage employees to make practical, sustainable lifestyle changes such as cycling, walking or taking public transit to work. Martino Contractors Ltd., Concord, Ont. HVAC contractor; 83 employees. Helps employees save for the future with contributions to a defined benefit pension plan. McDougall Insurance Brokers Ltd., Belleville, Ont. Insurance; 305 employees. Supports local and national charitable initiatives each year, focusing on youth, the environment, animals and community development. McLeod Law LLP, Calgary. Law firm; 116 employees. Offers a variety of alternative work options, including flexible hours, telecommuting and earned days off programs. MessagePoint Inc., Toronto. Communications management software; 63 employees. Provides a health spending account, allowing employees to top up coverage as needed. Natural Resource Solutions Inc., Waterloo, Ont. Environmental consulting; 38 employees. Offers opportunities for the next generation to gain career-level experience through co-op placements and summer employment. Next Level Games Inc., Vancouver. Game developer; 75 employees. Cultivates a dynamic work atmosphere and culture with numerous social events and celebrations throughout the year, including picnics and camping weekends. Nicola Wealth Management Ltd., Vancouver. Investment management; 143 employees. Encourages employees to volunteer with paid volunteer time as well as matching charitable donations. Norima Consulting Inc., Winnipeg. Information technology consulting; 59 employees. Offers generous referral bonuses as an incentive for employees to recruit candidates from their personal networks. North Atlantic, St. John’s. Petroleum refining and distribution; 146 employees. Offers academic scholarships for children of employees. Northforge Innovations Inc., Gatineau, Que. Computer software; 67 employees. Provides an employee lounge equipped with video games, table tennis and table hockey, onsite yoga classes and shower facilities. Olympia Financial Group Inc., Calgary. Trust company; 219 employees. Added 46 new full-time positions, a year-over-year change of more than 25 per cent. Perley-Robertson, Hill & McDougall LLP / s.r.l., Ottawa. Law firm; 113 employees. Offers generous bonuses for employees who refer candidates from their personal networks. Peterson, Vancouver. Real estate development and management; 181 employees. Offers the option to extend maternity leave into an unpaid leave of absence. Points, Toronto. Customer loyalty program software; 181 employees. Recognizes exceptional performance through numerous awards, including the Hi5 peer-led recognition program. Prophix Software Inc., Mississauga. Software developer; 162 employees. Offers numerous social events and celebrations throughout the year including mini golf, bowling, a Halloween costume contest and Jenga tournaments. ProServeIT Corp., Mississauga. Information technology services; 50 employees. Offers subsidies to employees for professional accreditations as well as full tuition subsidies for courses related to their current position. Pushor Mitchell LLP, Kelowna, B.C. Law firm; 122 employees. Encourages employees to give back to the community with paid time off to volunteer. R.F. Binnie & Associates Ltd., Burnaby, B.C. Engineering; 139 employees. Opened a new office in Calgary, increasing its full-time work force by approximately 20 per cent. Reliable Controls Corp., Victoria. Technology manufacturing; 123 employees. Offers phased-in work options to help those nearing retirement make the transition. Rocky Mountaineer, Vancouver. Rail tour operators; 240 employees. Created 47 new full-time positions in the past year, a year-over-year increase of nearly 25 per cent. Rohit Group of Companies, Edmonton. Real estate development and management; 145 employees. Hosts an annual company “Rotreat,” shutting down operations for three days and journeying to a five-star resort. Roma Moulding Inc., Woodbridge, Ont. Picture frame manufacturing and distribution; 99 employees. Lets everyone share in the company’s success with profit sharing. Sales Beacon Consulting Inc., Chester, N.S. Business consulting; 46 employees. Offers tuition subsidies, in-house and online training initiatives, mentoring and financial bonuses for the completion of some courses. Silvacom Ltd., Edmonton. Computer software and consulting; 66 employees. Offers numerous social events and celebrations throughout the year, including an awards banquet, family picnic and the Silva Cup video game tournament. Smart & Biggar/Fetherstonhaugh, Ottawa. Law firm; 384 employees. Provides maternity and parental leave top-up payments to new mothers and adoptive parents as well as a small top-up for fathers. Solink Corp., Kanata, Ont. Video surveillance software; 27 employees. Expanded significantly in the past year, increasing its full-time workforce by approximately 50 per cent. Startec, Calgary. Commercial refrigeration systems; 112 employees. Encourages employees to plan ahead with retirement planning assistance services and matching RRSP contributions. SysGen Solutions Group Ltd., Calgary. Information technology consulting; 50 employees. Offers generous referral bonuses as an incentive for employees to recruit candidates from their personal networks. TextNow Inc., Waterloo, Ont. 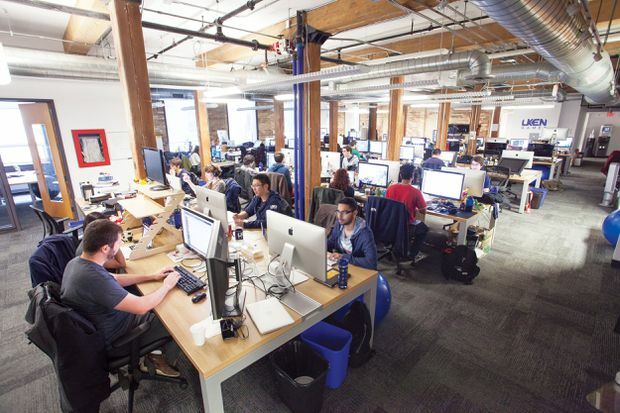 Software publishers; 73 employees. Offers a variety of onsite amenities including a cafeteria with free meals daily, an ice rink and a beach volleyball court. theScore, Inc., Toronto. Internet publishing; 205 employees. Encourages employees to become owners through a share purchase program, available to all employees. Thinkwrap Commerce Inc., Kanata, Ont. eCommerce services; 82 employees. Encourages employees to lead active, healthy lives with a subsidy for gym memberships. Traction on Demand, Inc., Burnaby, B.C. Marketing consulting; 270 employees. Encourages employees to volunteer with one paid day each year. Trico Homes Inc., Calgary. Housing construction; 115 employees. Encourages employees to apply their skills and work collaboratively to develop innovative solutions through the in-house Trico Innovation Lab. Trihedral Engineering Ltd., Bedford, N.S. Computer software; 31 employees. Starts new employees with three weeks of paid vacation with up to six weeks for long-serving employees over their careers. Trisura Guarantee Insurance Co., Toronto. Insurance; 108 employees. Helps employees get an early start to their summer weekends with early closings from Victoria Day to Labour Day. Uberflip, Toronto. Cloud-based marketing software; 80 employees. Offers onsite weekly fitness classes hosted by a professional instructor, including yoga, kick-boxing and Krav Maga self-defence courses. Uken Studios Inc., Toronto. Game developer; 77 employees. Offers flexible work hours and telecommuting work options to help employees balance their work and personal lives. Upstream Works Software Ltd., Vaughan, Ont. Software developer; 67 employees. Encourages employees to recruit their friends with generous new employee referral bonuses for every successful hire. Valard Geomatics Ltd., Edmonton. Surveying and mapping; 89 employees. Encourages healthy choices with a variety of fresh fruit in the employee lounge and sheltered parking for its bicycle commuters. VelocityEHS Canada, Oakville Ont. Software developer; 87 employees. Features telecommuting workstations at their head office. Verafin Inc., St. John’s. Specialized financial software; 248 employees. Provides two kitchen areas stocked with free healthy snacks, from breakfast cereals to cookies. Voonyx Inc., Lac-Beauport, Que. Computer software; 29 employees. Offers new employees four weeks of starting vacation allowance, time off for winter holidays and four additional paid days. Wave, Toronto. Financial services software; 128 employees. Added almost 50 new positions last year, a 58-per-cent increase in personnel year-over-year. Welch LLP, Ottawa. Accounting; 265 employees. Offers a variety of alternative work options, including telecommuting, flexible hours, earned days off, compressed and shortened work weeks. Wesgroup Equipment LLP, Surrey, B.C. Industrial machinery and equipment distribution; 171 employees. Supports ongoing employee development through apprenticeship and in-house and online training initiatives as well as tuition subsidies for courses at outside institutions. Wild Rose Brewery, Calgary. Breweries; 57 employees. Provides an onsite pub where employees can enjoy the fruits of their labours.